First discovered in the early 1960’s, the primary cilium remained an “abortive structure with no function” for four decades. 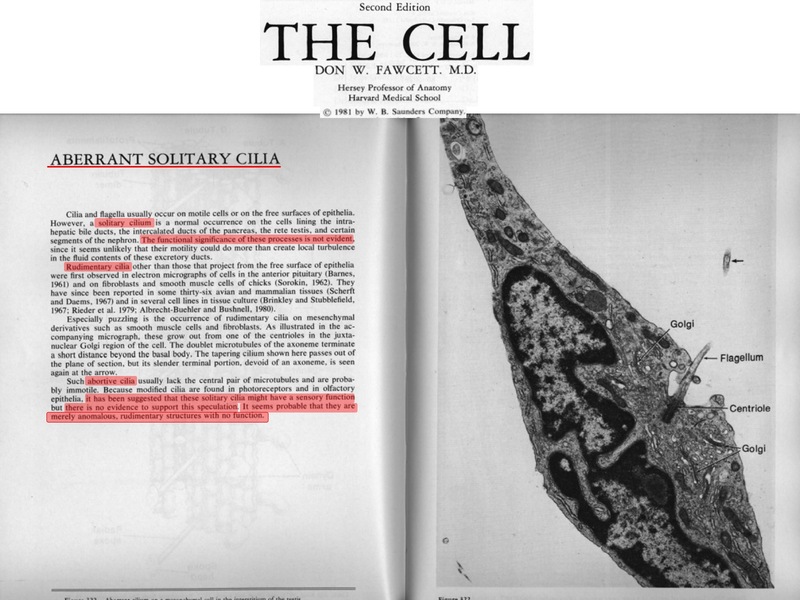 Fast forward to 2006 and the term “signaling antenna” is coined to describe primary cilia. 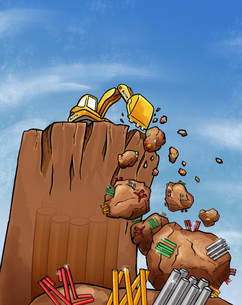 This 180-degree shift in perception was fueled by two major advances: First, ciliary dysfunction was recognized as the culprit in a broad class of disorders characterized by obesity, cystic kidneys, retinal degeneration, skeletal malformations and brain anomalies. Second, Hedgehog signaling, a major developmental signaling pathway was shown to require cilia for its signal transduction. The cilium is now recognized as a vessel that transforms signaling inputs into processed information for the rest of the cell by dynamically concentrating signaling molecules within a specialized environment. How do diffusion barriers allow the selective passage of proteins into and out of cilia? How are signaling receptors packaged into extracellular vesicles at the tip of cilia? How is the ciliary proteome altered in specific cilopathy mutants? ​A hallmark of ciliary signaling pathways is the dynamic redistribution of signaling molecules in and out of cilia upon pathway engagement. For example, during Hedgehog signaling, the G protein coupled receptor GPR161 moves out of cilia and the GPCR Smoothened accumulates in cilia. The BBSome, a stable complex of eight Bardet-Biedl proteins, assembles a coat upon recruitment to membranes by the small Arf-like GTPase ARL6/BBS3. 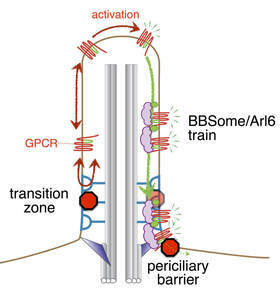 Single molecule tracking of signaling receptors enabled us to demonstrate that the BBSome coat moves activated GPCRs across the diffusion barrier at the transition zone and out of cilia. A periciliary diffusion barrier must also be overcome for exit from cilia to be completed. The existence of a selective membrane diffusion barrier is without precedents. We combine biophysics, live cell imaging, biochemistry and structural biology to understand how the transition zone blocks the passage of most proteins while letting a select few proteins cross. When BBSome-dependent retrieval fails, activated GPCRs become packaged into extracellular vesicles at the tip of cilia, a process known as ectocytosis. Ciliary ectocytosis is conserved from unicellular algae to man and is required for the appropriate transduction of Hedgehog signals. Congruent with its consumption of ciliary membrane, ectocytosis can even lead to shortening of the cilium. We have identified actin and a group of actin regulators as the main actors in the scission of ciliary extracellular vesicles. The machinery that selects GPCRs for incorporation in extracellular vesicles and the range of function of cilia-derived extracellular vesicles remain to be determined. We seek to dissect the molecular mechanisms by which signaling receptors are packaged into vesicles at the tip of cilia. Our overarching goal is to determine the functional importance of ciliary ectocytosis: is it only important in a cell-autonomous manner to clear excess proteins from cilia or does it function in cell-cell communication? The full extent of signaling molecules organized by cilia remains unknown. Since cilia purification is not feasible in mammalian cells, we set out to identify ciliary proteins by targeting the proximity biotinylation enzyme APEX to cilia and capturing biotinylated proteins. 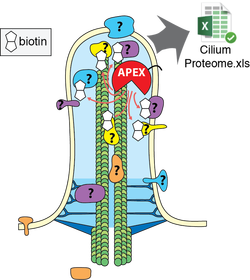 The development of the cilia-APEX technology led to the identification of novel signaling axes in cilia. These include the AMP-regulated protein kinase (AMPK), pointing to a possible role of cilia in sensing energetic cues, and the cAMP-dependent protein kinase (PKA), which led us to show that Hedgehog signals are transduced by intra-ciliary cAMP and PKA. It is tempting to speculate that cilia regulate second messenger concentrations separately from the rest of the cell, thus affording localization-dependent regulation to various signaling pathways. The advent of highly sensitive and quantitative proteomics of primary cilia will transform our experimental approach. First, the sensitivity of cilia-APEX surpasses traditional methods of immunodetection. We have uncovered proteins that rapidly traverse cilia and remain undetectable by immunohistochemitry yet play important roles inside cilia. Second, the minute-scale temporal resolution of cilia-APEX shall enable a characterization of the changes in the ciliary proteome that take place during the course of Hedgehog signaling and other ciliary signaling pathways. Finally, profiling the genotype-dependent alterations of the ciliary proteome will help uncover the molecular etiology underlying each ciliopathy, offering hope for novel mechanistic insights into ciliary biology. In 2010, we made the serendipitous discovery of the long-sought tubulin acetyltransferase TAT1/MEC-17. Unlike other microtubule-associated proteins or modifying enzymes, TAT1 functions inside the lumen, a far more poorly characterized location than the outer surface of microtubules. What changes in microtubules when a 1-carbon group is added to a lysine residue that projects inside the lumen? To answer this question, we combined microfabrication and microfludics (collaboration Manuel Théry) with the production of tubulin with defined aceylation levels. This led to the demonstration that acetylation directly alters the mechanical properties of microtubules, making them more flexible and less susceptible to breakage. We went on to develop FRET-based assays to probe the specific interactions modulated by acetylation and found that lateral contacts between protofilaments are weakened by acetylation. Acetylation thus increases lattice plasticity to make microtubules more resilient. In this sense, long-lived microtubules are better equipped to resist the mechanical stresses they experience during their lifetime because they are acetylated. Alteration of microtubule mechanics by acetylation helps set the correct cell stiffness, a particularly important property for mechanosensory cells.